A must-have book for anyone that uses the command line daily. This is a book I have been recommending since it was first published, and I will definitely recommend it again! The tricks mentioned in this book completely changed my workflow. I recommend this book to anyone who is looking to improve their workflow on the command line. The author always has something amazing in store for you: custom commands to fire up your development environment, customizing it, pair programming, and many use cases. This book makes you step up your game in becoming a more efficient developer. I had zero tmux experience before picking up the book, and I could use tmux in my day-to-day routine after reading the book. You have a database console, web server, test runner, and text editor running at the same time, but switching between them and trying to find what you need takes up valuable time and breaks your concentration. 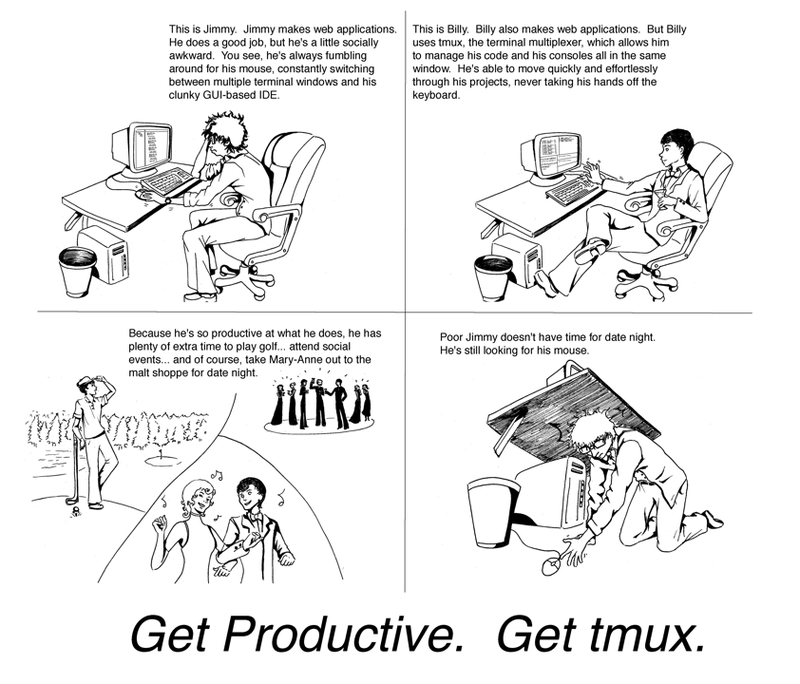 By using tmux 2.3, you can improve your productivity and regain your focus. This book will show you how. This second edition includes many features requested by readers, including how to integrate plugins into your workflow, how to integrate tmux with Vim for seamless navigation—oh, and how to use tmux on Windows 10. Use tmux to manage multiple terminal sessions in a single window using only your keyboard. Manage and run programs side by side in panes, and create the perfect development environment with custom scripts so that when you’re ready to work, your programs are waiting for you. Manipulate text with tmux’s copy and paste buffers, so you can move text around freely between applications. Discover how easy it is to use tmux to collaborate remotely with others, and explore more advanced usage as you manage multiple tmux sessions, add custom scripts into the tmux status line, and integrate tmux with your system. This book is written for tmux 2.3 or higher. You’ll need a Mac or Linux machine, or a machine running Windows 10 with the Windows Subsystem for Linux installed. You’ll also need some experience running shell commands. Brian P. Hogan is a web developer, author, and editor who loves to learn how software development works so he can explain it to everyone else. He is the author of Exercises for Programmers, Automate with Grunt, HTML5 and CSS3, Second Edition, Build Real-Time Web Apps with Phoenix, and the co-author of Web Development Recipes, Second Edition.